A bench with curvy legs and a curvy silhouette is a classic design in French Country style. A curvy bench in a solid color is French Country, but to give your bench more French Country style, cover it in toile. Toile fabrics have been used in French homes since the late 1700s and come in many color combinations including neutral tones of beige with brown and black with white. 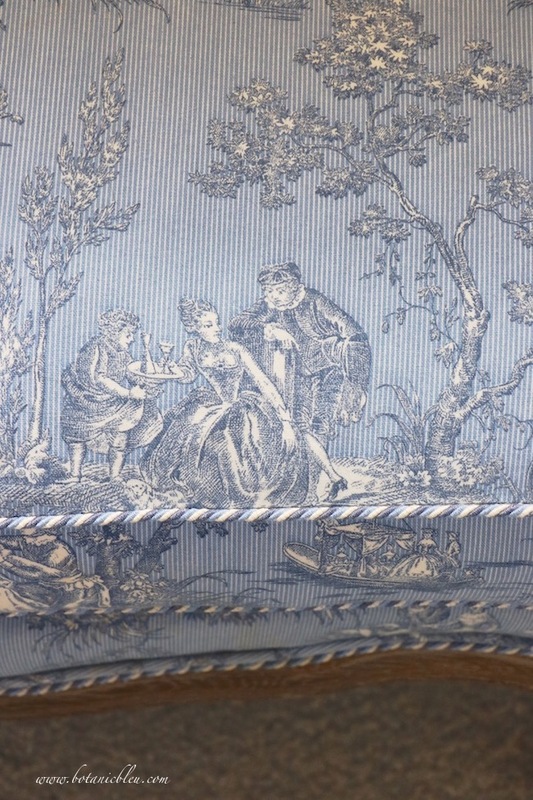 Pattern, not color, is the key to what defines fabric as toile. 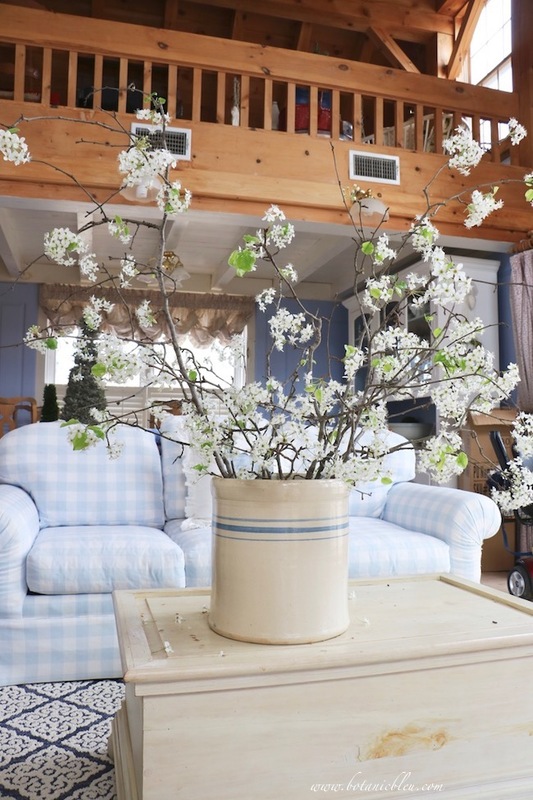 Pastoral scenes in any color add French style, but blue and white toile is one of the most popular color combinations. Add cording to outline the bench's upholstery to define the curves and upscale the look. Voilà, your bench is trés chic. 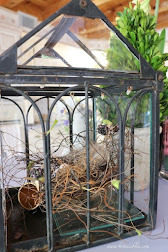 An inexpensive way to add instant French Country decor is to use French linens, both new and vintage. You do not have to find vintage linens to define your French Country style. Fine linens are not a thing of the past; France is still renowned for fine linens. When you think of lavender, you may think of fields and fields of French lavender used to make perfume and to make sachets. 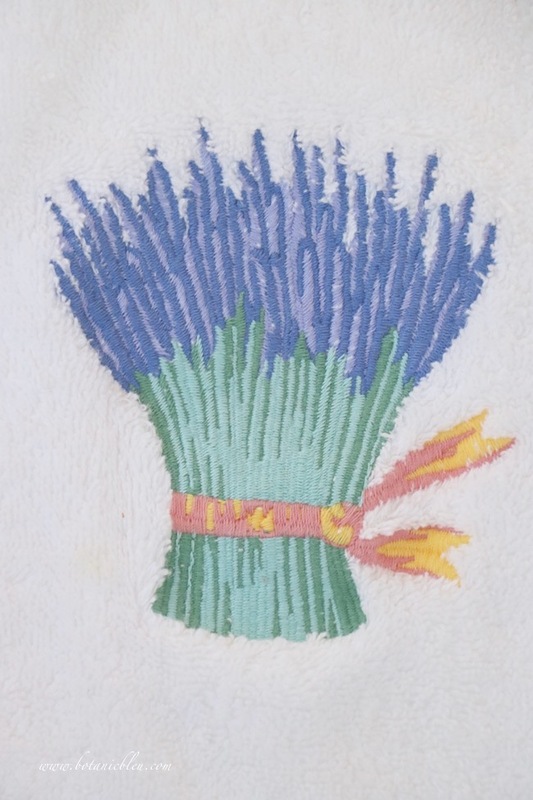 A hand towel embroidered with a bundle of lavender conjures images of the French countryside. 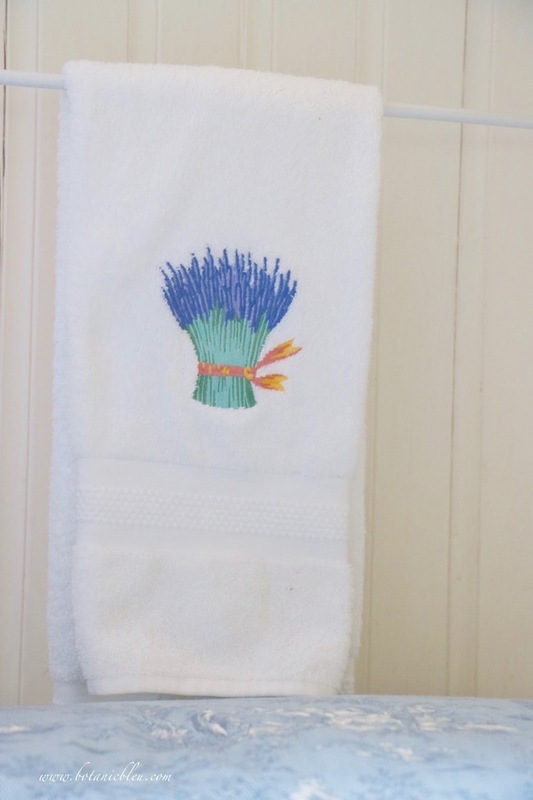 If you are lucky enough to find vintage French linens, it only takes one hanging on your linen closet door to add French Country style to your bathroom. Iron hooks on bathroom doors are another inexpensive French Country accent. Look for hooks with curvy details for subtle French design. Eiffel towers, fleur de lis, and numbers can also be used, but French Country style is often understated elegance like the white iron hook. You can always change the color of a hook with spray paint, so look for the style first, and customize the color as needed. 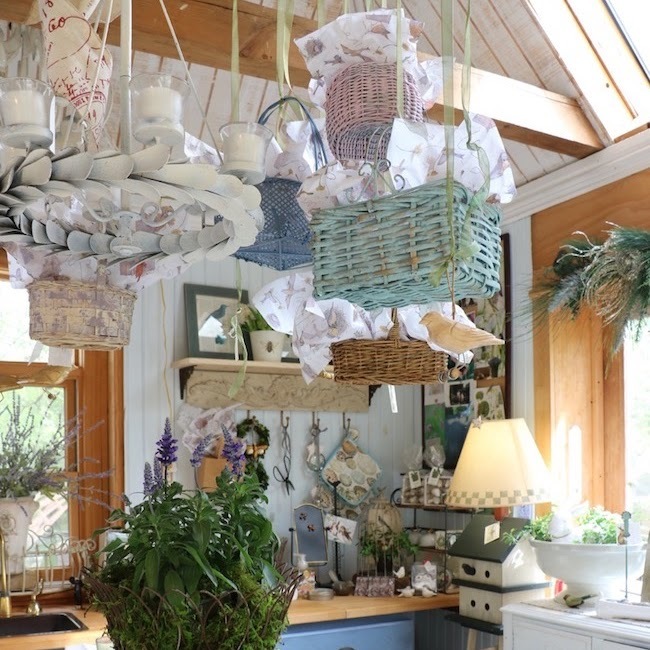 Hooks can be used for decorative or functional purposes. 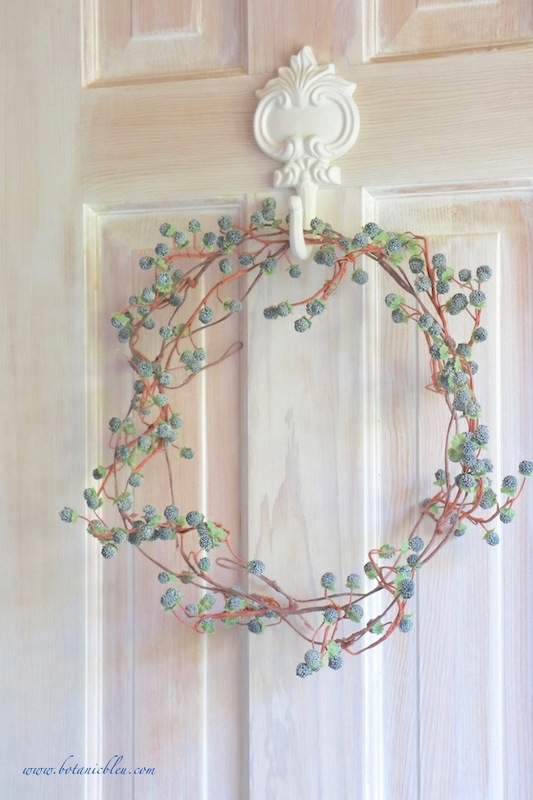 On the outside of bathroom closet doors, display a simple wreath with a touch of color. 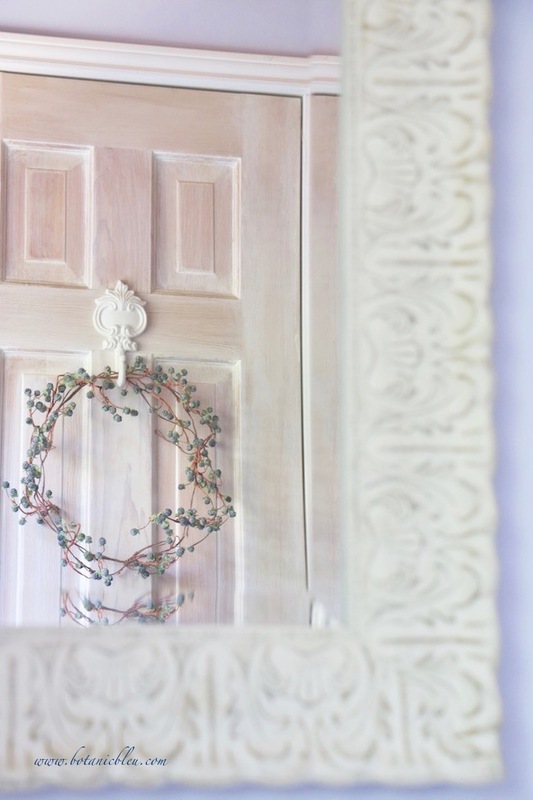 Keep wreaths simple to avoid them getting in the way when you are in a hurry during your morning routine. 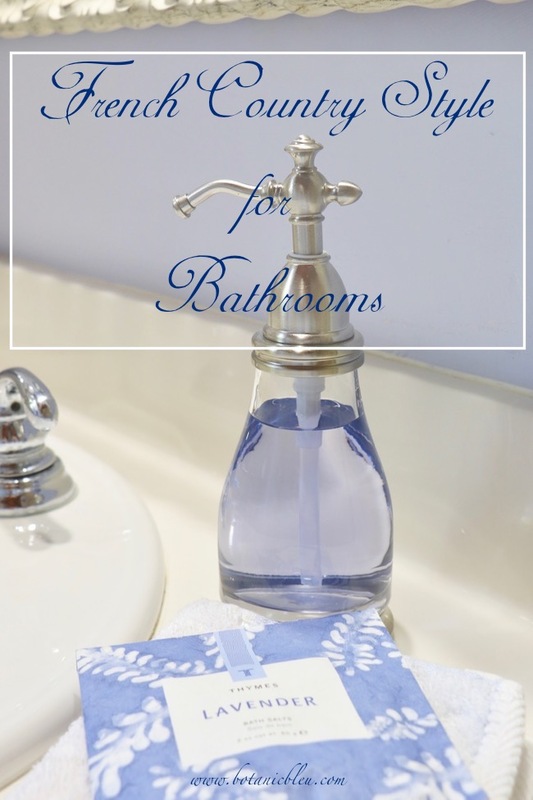 Materials should hold up in humid bathroom conditions and should be easy to keep clean with just a few quick wipes. 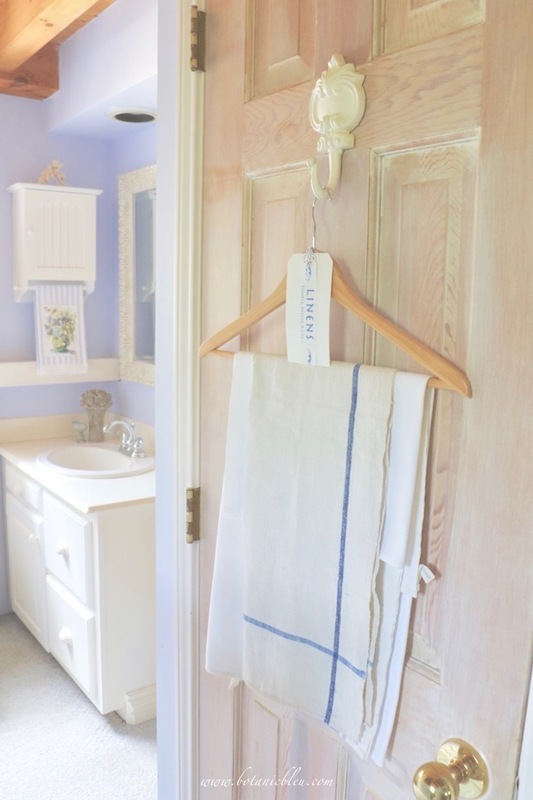 On the inside of bathroom doors, use hooks for towels, bathrobes, and small laundry bags. Hidden from public view, but easily accessible to make your bathroom more functional. 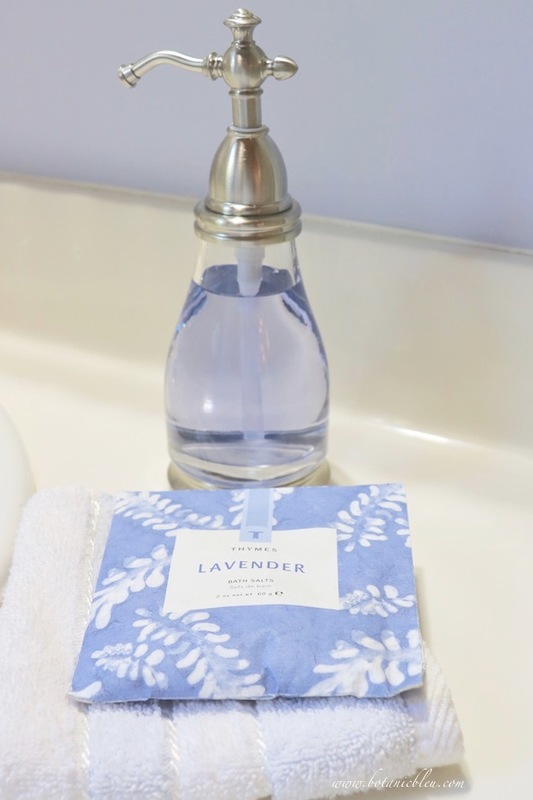 Fragrant lavender soap and sachets are quick, easy, and inexpensive French Country accents that complement the French embroidered lavender hand towel. 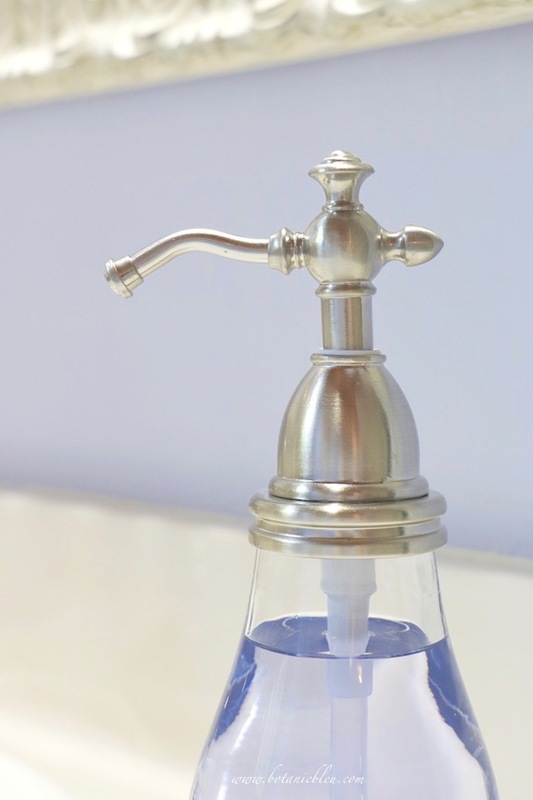 Transfer liquid soap into a pretty glass bottle with a French-inspired dispenser. Save money by buying large refill sizes of your favorite soap, and, at the same time, help save the environment by using fewer plastic bottles. One large refill size is often the same amount as in four or five small bottles. Lavender bath salts come in paper packages that are too beautiful to throw away when empty. 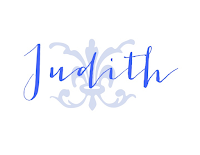 Set a filled bath salts package atop a blue and white striped bath cloth or hand towel to add both a light fresh fragrance from France and a touch of color to a white vanity. If you are traveling to France this summer, try shopping in large department stores for quality new French towels. Of course, be sure to set aside a couple of days for visiting flea markets or street brocantes in Paris for vintage linen napkins, towels, and sheets. 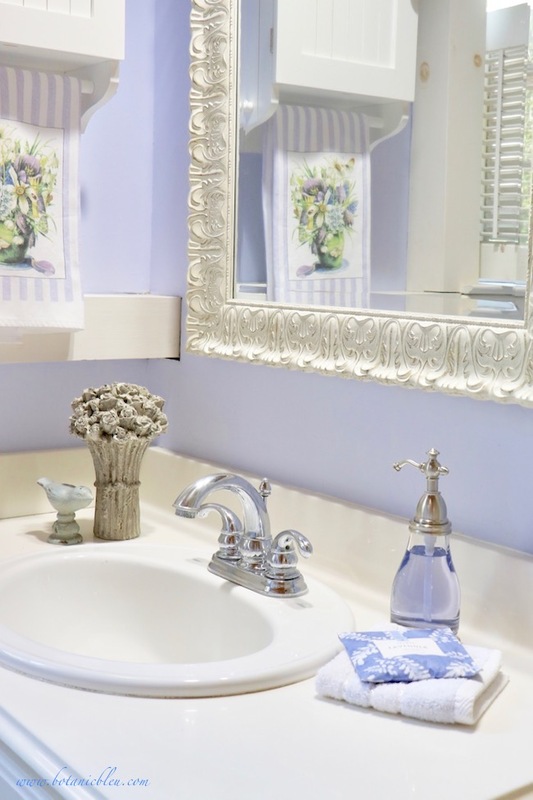 You can bring French Country to your bathroom without structural changes to the room. All you need is a handful of French accents. Like these ideas for adding French accents to your home? 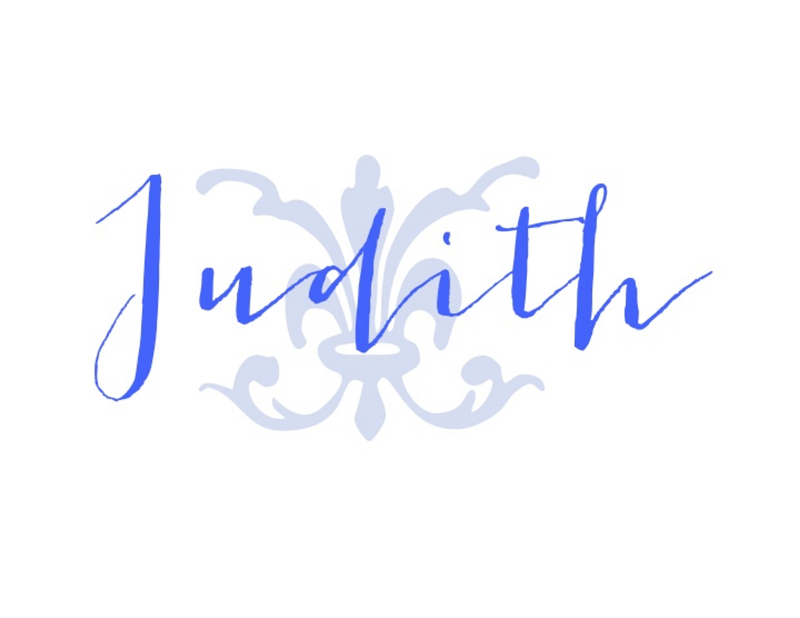 Do you have a favorite source for French-inspired accents right here in the USA? 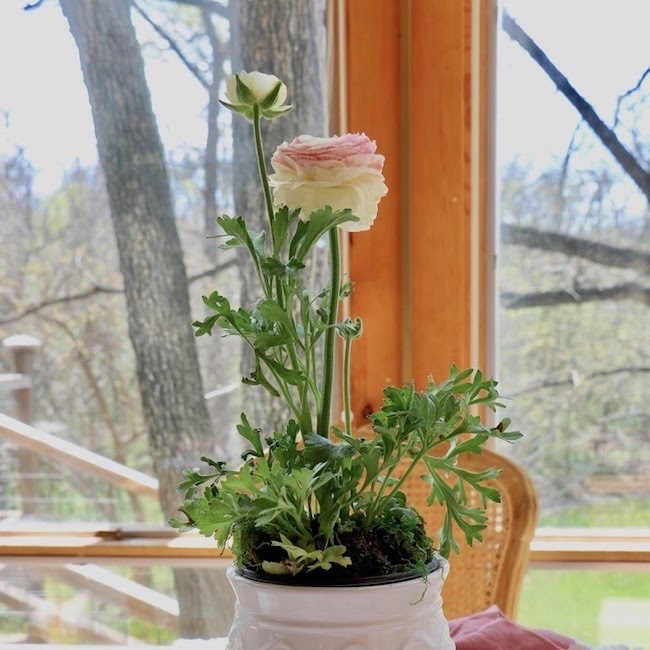 Want to read more about how to create a French-inspired garden and home? 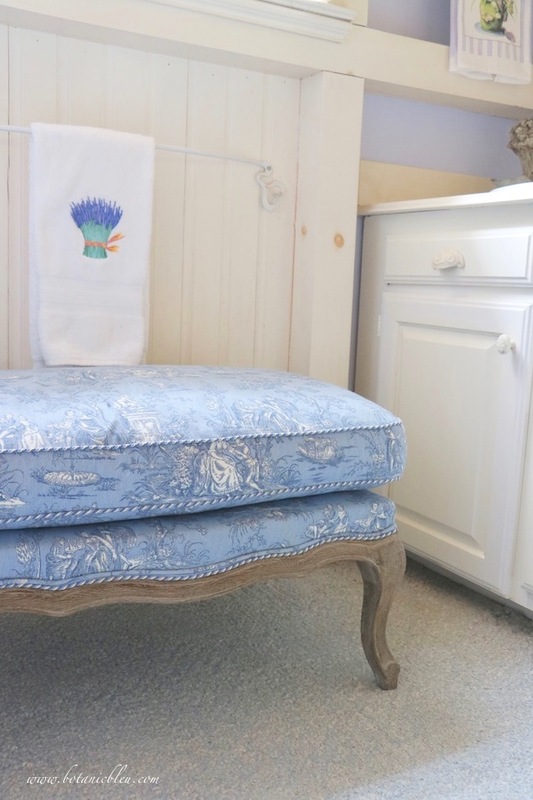 Your toile bench is beautiful. Lovely bathroom with french touches. Thank you, Bonnie. The toile fabric is my all-time favorite toile. I am still working on the bathroom. 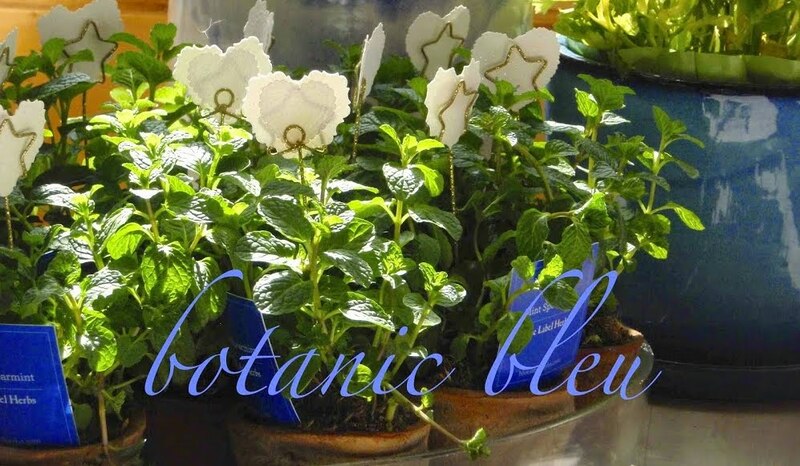 A new blue and white silk Roman shade should be ready to install in about a week. Your bathroom turned out so pretty and I have to say that ottoman is just stunning! 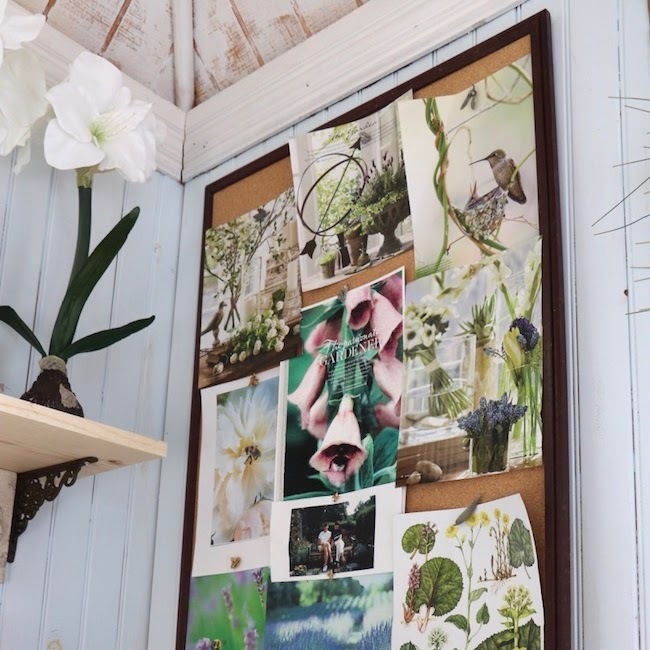 You have such great ideas for adding beautiful touches to our homes. I loved seeing the sources because it proves that nice things can be found in such a variety of places. A new multi-colored blue and white silk roman shade should be ready to install later this week. I love the fabric. Gorgeous. I'd love to go to France again. Thank you. My sister and I talk all the time about traveling back to France. If only we could be instantly transported there and not have to fly for so many hours. 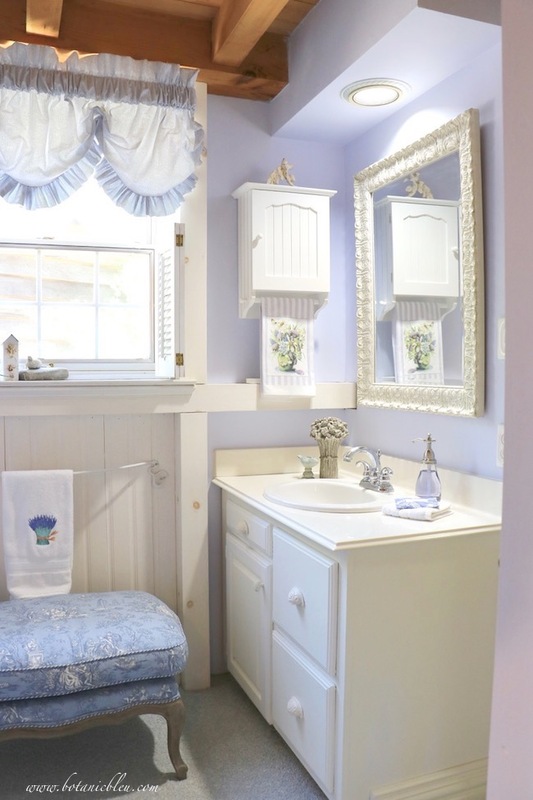 Love the light colors in your bathroom and the other touches are so pretty. I have been wanting to add things to ours, but we are getting ready to remodel it and so I will be searching for ideas. Thank you so much. It has taken me years to finally get to this stage in my bathroom. Remodeling is hard to live through, but you will enjoy the results.